A city holiday in Copenhagen does not mean you have to compromise and miss out on trips to the beach or sunbathing in lush green parks. Even though you're in the middle of a big city, you never have far to travel from the centre of Copenhagen to be able to dig your toes in the sand and see water as far as your eye can see. But if you prefer grass and the chirping of birds, then you'll find green oases all over Copenhagen. We have put together a list of beaches located close to Copenhagen city centre, which are easy to reach by car and public transport. When you stay at Scandic, you can rent bicycles – so why not jump on a two-wheeler and head out to the nearest beach? Once you start exploring Copenhagen, you'll soon discover that there are not many metres between all the parks and green oases. We have put together some of Copenhagen’s favourite parks on this page. Amager Strandpark is Copenhagen’s largest beach and is located no more than 5 km from downtown. You’ll find lagoons, sand and park areas if you prefer sunbathing and relaxing on the grass instead of the sand. In summer, the area invites visitors to enjoy fun and outdoor activities like windsurfing, diving from the rocks and kayaking. On the outskirts of fashionable Osterbro in Copenhagen, a 130 metre seaside pier extends far out into the bay. From here, water enthusiasts and swimmers can plunge into the blue waves. In summer, the 100 metre long sandy beach is busy, and even the youngest swimmers can relax and enjoy themselves safely here. Svanemollen beach is a man-made beach with the finest sand, transported straight from Oresund. If you can tear your gaze away from the endless sea, you'll be greeted by a view of the harbour’s urbane and beautiful buildings. You can enjoy the views of the buildings in the harbour designed by Kim and Jorgen Utzon. North of Copenhagen and a stone’s throw from Dyrehaven, you'll find beautiful Bellevue beach – a delight to the eye. The beach is located 10 kilometres from Copenhagen and boasts plenty of sand and park areas for visitors to enjoy. 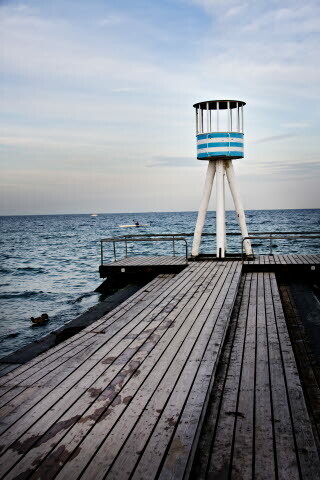 The huge bathing piers are the ideal platform for jumping into the clear water of Oresund. On the way to or from the beach you can pay a visit to Dyrehaven park, where many Copenhagen residents enjoy spending the weekend. We can also recommend a visit to the Karen Blixen Museum, about 15 km further up the coast to the north. In the 17th century, Christian IV ordered a piece of land in the middle of Copenhagen to be cleared for houses and gardens. The King planned to build a castle and pleasure garden there. Today, the King’s Garden ('Kongens Have' in Danish) is the most popular park in Copenhagen. Situated in the middle of the garden is Christian IV’s old castle Rosenborg Castle – a true adventure castle and well worth a visit! No matter whether you visit the King’s Garden in the autumn, winter, spring or summer, it's always busy with residents of Copenhagen who, depending on the season, warm themselves with a hot cup of coffee, admire the hundreds of crocuses in front of Rosenborg Castle, or sunbathe on the lawns. The Garden’s youngest guests can have fun in the park’s impressive playgrounds or dip their feet in the waters of the fountain. Many people think that Ostre Anlaeg park is underestimated. That’s a pity because the park has a great deal to offer! The National Gallery of Denmark is located at the southern end of the park and, like everything else, is a must-see during your visit to Copenhagen, and at the northern end is Osterbro and Osterport train station. Ostre Anlaeg was designed by H. A. Flindt, who is also the man behind the Botanical Garden. You'll find rose gardens here as well as a giant playground and the city’s (perhaps) best toboggan hill. Many of the park’s guests enjoy grilling their summer evening meals in the park, which offers plenty of opportunities to do so. The park is also home to the 'Denmark Monument' – a pompous statue that stood before the National Museum of Art until 1920. There are mixed views about the Denmark Monument (three lions and a large woman), and so it was decided to place the old statue in Ostre Anlaeg. Immerse yourself in the peace and quiet of the Botanical Garden. You forget about the bustle and noise of the city the moment you enter the old garden. As the name suggests, you'll find plants from all over the world here, and the garden is used primarily for research, teaching and providing information to the public – and it is also visited by hundreds of Copenhagen residents and tourists every day. The garden is home to a huge greenhouse with plants that thrive in the hot, humid conditions not otherwise offered by the Danish climate. Since the 17th century, the Garden has undergone a number of changes. The Botanical Garden as we know it today was designed by H. A. Flindt in the 1870s. In 1969, the garden was listed by the Danish conservation authorities.